My whole life, I’ve had severe motion sickness. When I was little, I couldn’t get into a car without a “choke bowl” (usually an empty Cool-Whip container). I have distinct memories of the journey across town to my aunt’s house—I can still see the roadside littered with the puke dumped out of my Cool-Whip bowl and the kleenexes used to wipe off my face. Over the years, I somehow learned to suppress the vomit reflex but was always left with the nausea. It was a useful skill to have. There are many times when it is inopportune to puke, such as a taxi-cab in Paris, a bus in Ireland (Amy, you will remember this), or your in-laws’ mini-van. I’m not quite sure how I do it… maybe it’s part self-hypnosis, part meditation, part mystery. But what has resulted is that over the years I’ve become so good at suppressing the urge to vomit, that it is very, very difficult for me to throw up. Since becoming pregnant with Fig, I’ve thrown up 81 times. All but about 3 of these times were between week 5 and 11-ish, at which point I went on Zofran. The most I ever threw up in one day was 9 times, which really isn’t that much compared to a lot of women who’ve had all-out hyperemesis gravidarum (HG). During a typical day, I would only throw up 4 or 5 times (some women with HG throw up 20 times or more). The problem was, of course, the nausea. To get me to throw up even once—much less 4, 5, or even 9 times—required no small feat. Generally, I would wake up in the morning… feeling sick. Sometimes I would puke once or more. I might eat, or might not eat; either way, the nausea would rise to a deafening crescendo that would leave me motionless in bed for several hours, until finally around 1pm I would throw up. There might be a few more hours of lying in bed before I threw up again. Usually it would get worse around 5 or 6pm, and I’d throw up several times in the evenings. On more than one occasion, I’d be puking when Rob came in the door after work/swimming/biking/running or whatever it was he had going on. Most of the time when I threw up, my stomach was empty to begin with, so I didn’t have to contend with chunks of food. And I preferred it this way. Stomach acid is not pleasant, but I got used to throwing it up. There were times, however, when I would become ridiculously, freakishly, out-of-control, crazy-hungry. Desperate enough to have eaten roast beef it had been placed in front of me (thank god it wasn’t). I ate some very strange things during this time, and unfortunately I learned what it was like to throw each of them up. Below is a list—a guide, if you will—from the terrible to the downright pleasant. Dairy. ( Oh. My. God. Dairy. ) The single worst experience of my life may have been throwing up cheese tortellini. Tied with the time I threw up tapioca pudding. Let us not speak of this again. Ginger-Ale (burny and zingy on the way back up, but I could handle it). Baked potato (at the time I recall being surprised that this wasn’t as bad as I’d expected. But remembering it now makes my heart stop a little. I haven’t eaten potato since this incident). Grapefruit (people told me that puking citrus was abominable; I actually didn’t think it was that bad). Honeycomb cereal, dry. (Seriously. It was not only not bad, I would go as far to say it was actually enjoyable. It digests remarkably quickly [like 15 minutes], and on the way up, it tastes good). It isn’t always food that makes me nauseated. At my worst, taking a shower almost always made me throw up, but then again, going too long without taking a shower made me sick as well. I couldn’t stand the scent of unscented soap. I couldn’t wash my hair, wash dishes, scrub floors, vacuum, clean anything, fold laundry, turn on the stove, be in close proximity to people, ride in a car, ride my bike, or sometimes even walk. It’s been tough, but what got me through worst of this was the thought that one day it would become something to laugh about—just a passing memory. Unfortunately, I have not quite made it to that point. At this precise moment when I’m writing, I feel okay. But I’m coming off 2 days when I felt like hell and had to lie in bed trying to breathe my way through the nausea. I found out the hard way that even though I am nearly halfway through this pregnancy, if I try to go off Zofran, I end up puking like it’s week 9 all over again. 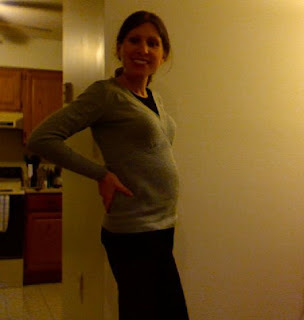 When this whole pregnancy-induced-nausea began, I was actually pretty calm about it. I know from all the marathons I’ve run that the worst thing you can do is let negative thoughts creep into your brain, because once you do, all hell breaks loose. So I refused to let myself be anything other than calm. I didn’t even take it one day at a time—I just got through one minute and then would move onto the next. And I constantly reassured myself that this too would pass. It would all be over soon, and the only way out was through. It’s gotten harder as the weeks continue to go on and I’ve passed several points of no return (I’ll feel better by Valentines’ Day… by week 16… by week 18…). The other night, when I was in the depths of a nauseated despair (all sense of calm having flown out the window), I started to get angry too. Over the years, a lot of people have said some incredibly rude and inappropriate things to me regarding my lack of procreation. I thought of these people and the things they had said to me, and all I wanted to do was smash my fist into a wall and scream something to the effect of ARE YOU HAPPY NOW??!! ARE YOU ! @#$%^* HAPPY?? But I didn’t do that, and eventually I fell asleep and felt better in the morning. I wrote all this down because as difficult as it has been at times, I want to remember it. People tell me that I’ll forget about this part eventually, and that I’ll want to have another kid—a sibling for Fig. I don’t know what the future holds. I said I would never, ever, have a baby, but now here I am, doing this. What I do know is that if somebody makes a remark about future progeny and I am in the wrong frame of mind, my likely response will be to strangle them. Hoping for minimal nausea in week 19. Thanks for reading. OH MY GOSH... You're so cute!!! I can add salmon and chorizo sausage to the list of very very very terrible things. If I didn't have such a carnivore husband,I would be perfectly content being a vegetarian after nearly nine months of HG. It is true that you may want to have a sibling for Fig someday. However, over two years later, I still have not forgotten it. Maybe I am traumatized. All I know is that I am very thankful that soy milk tastes good again. Whenever it comes, that will be a happy day for you indeed. Hang in there. I love to read your posts ... i hope Fig is paying attention to your writing talents ... it makes me so very sad to think of you being so sick most of the time ... just like it did when mimi was so very sick during her pregnancy ... you both always seem farther away when you're sick ... maybe it would be good to continue making new targets for no nausea ... you look absolutely beautiful!!! thank you so much for the picture of you and Fig.